Chroma 63800 Loads can simulate load conditions under high crest factor and varying power factors with real time compensation even when the voltage waveform is distorted. This special feature provides real world simulation capability and prevents over-stressing resulting in reliable and unbiased test results. 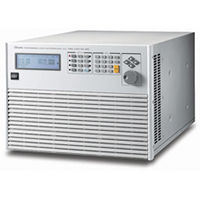 The 63800 AC & DC Electronic Load provides unique capability to simulate non-linear rectified loads for a wide range of testing applications. 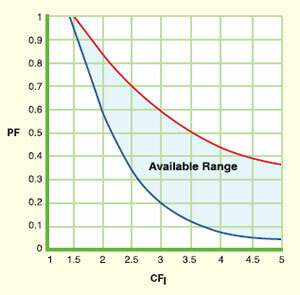 There are three load modes available for rectified load simulations: RLC, CP and Inrush Current. The figure below shows the typical model of a rectifier input. For inrush current simulation (see below), the 63800 provides an Inrush Current mode that allows the user to set different inrush current amplitude and voltage phase angle where the inrush current started. Chroma’s AC Electronic Loads are designed for testing uninterruptible power supplies(UPS), Off-Grid Inverters, AC sources and other power devices such as switches, circuit breakers, fuses and connectors. The Chroma 63800 Loads can simulate load conditions under high crest factor and varying power factors with real time compensation even when the voltage waveform is distorted. This special feature provides real world simulation capability and prevents over-stressing resulting in reliable and unbiased test results. Comprehensive measurements allow users to monitor the output performance of the UUT. 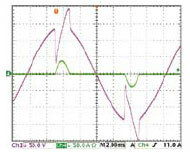 Additionally, voltage & current signals can be routed to an oscilloscope through analog outputs. The instrument’s GPIB/RS232 interface options provide remote control & monitor for system integration. Built-in digital outputs may also be used to control external relays for short circuit (crowbar) testing. Chroma’s 63800 Loads feature fan speed control ensuring low acoustic noise. The diagnosis/protection functions include self-diagnosis routines and protection against overpower, over-current, over-voltage and over-temperature. 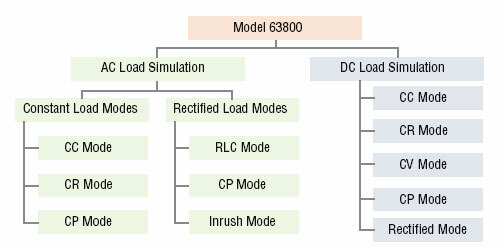 The Model 63800 AC & DC Electronic Load provides two unique operating modes for AC load simulation; (1) Constant Load Modes and (2) Rectified AC Load Modes. Each are described below. Figure 2 shows the typical model of a rectifier input. Under RLC mode, users can set the RLC values to 100% and simulate the behavior of the actual UUT. 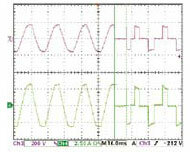 Figure 3 & 4 compares the voltage and loading waveforms between the actual RLC built circuit and the simulated rectified circuit by using Chroma’s RLC load mode. The waveform obtained under CC mode with the same loading crest factor shown in Figure 5. For inrush current simulation (See Figure 6), the 63800 provides an Inrush Current mode that allows the user to set different inrush current amplitude and voltage phase angle where the inrush current started. This entry was posted in Chroma. Bookmark the permalink.